We hereby inform you that we are processing your personal data for the purpose of service providing. Details below. The controller of your personal data is TAMADA TOUR SP. Z O.O. with its registered office at the following address: ul. Fiołków 3, 05-540 Zalesie Górne. 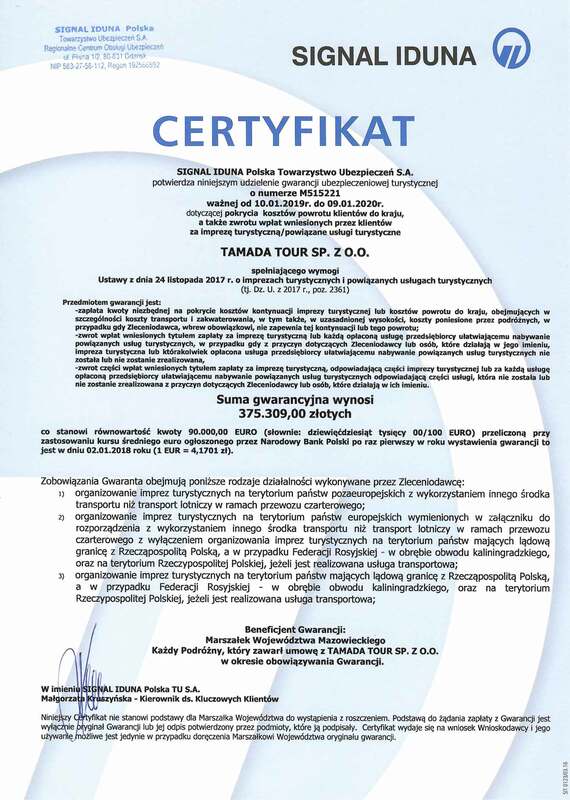 Tamada Tour is registered under KRS (National Court Register): 0000707203 whose records are stored by The Regional Court for the capital city of Warsaw in Warsaw, 14th Economic Division of the National Court Register, NIP (Tax payer ID): 1231379649, REGON (Polish National Business Registry Number): 368894676, share capital: PLN 50,000, e-mail: biuro@tamadatour.pl, phone: 792 004 069. H88 S.A. with its registered office at the following address: ul. Roosevelta 22, 60-829 Poznań. The purpose: keeping personal data on servers. The Rocket Science Group LLC d/b/a MailChimp with its registered office: 675 Ponce de Leon Ave NE, Suite 5000 Atlanta, GA 30308 USA. The purpose: mailing system services. Biuro Rachunkowe Radosław Król [Radosław Król Accounting Office] with its registered office: ul. Główna 67, 05-502 Bobrowiec. The purpose: accounts. our partners, who participate in providing services for you. Your data will be processed until any prospective claims you may raise become void by prescription. Data included in invoices will be processed as long as accounts documentation shall be kept. Moreover, part of data may be also processed after the specified period for data processing has lapsed for the purpose of our business maintenance with respect to archiving, statistics and analysis. More details above. right to make an appeal to supervisory authority (if you think that we process your data illegitimately, you make an appeal to The President of the Protection of Personal Data Office or other competent supervisory authority). 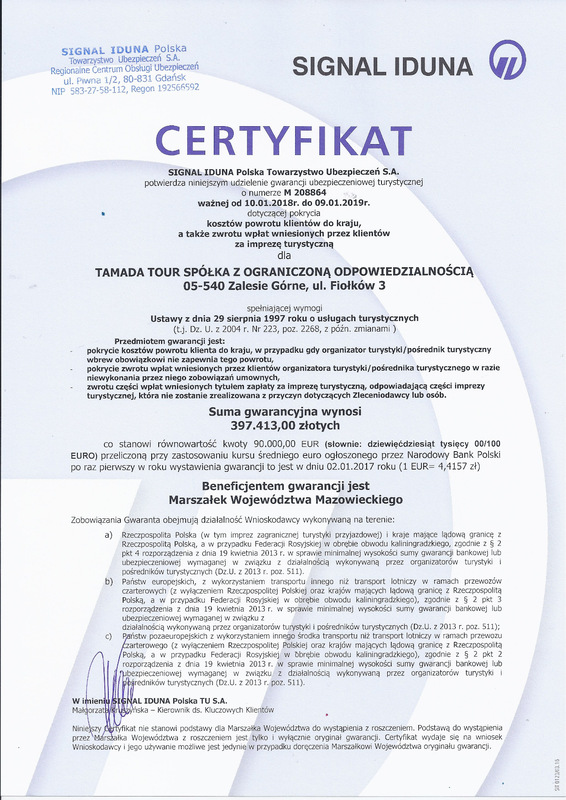 With the aim of exercising your rights, please send your demand at the following e-mail address: biuro@tamadatour.pl. Be aware that we will have to check your identity before exercising your rights. Providing personal data is a necessity to use our services.